We finally go hands-on with the Surface RT. Here's our first impressions. The first thing that strikes you about the Surface is its build quality. In short, it's excellent and really feels like a premium product from the moment you pick it up. Microsoft has made a lot of fuss about the stand in particular, but it's the overall design of the Surface RT that impressed us most. The edges angle outwards from the back and the matte finish leaves a very positive first impression. The overall look and feel of the Surface RT is unique, too. In a world where many tablets look similar, the Surface's design is quite distinctive and can't really be mistaken for any other products on the market. The kickstand built into the back allows the Surface RT to stand up on a desk or table, though we weren't able to test how well it works on your lap. The stand definitely feels very well constructed and durable, though Microsoft claiming it sounds like the door of a "luxury car" when closed is a little far fetched. The stand is easy enough to kick out thanks to an indented slot on the left side that allows space for your fingertip. However, we wish the same slot was built into the right side, too. Microsoft had both keyboard accessories on show with the Surface RT, the $139.99 'Touch Cover' and the $149.99 'Type Cover'. The 3mm thin Touch Cover received the most attention and worked relatively well in our brief hands-on time. However, it will certainly have a steep learning curve for those used to regular keyboards and you'll no doubt make plenty of typing mistakes with initial use. For people concerned about steep learning curves, the Type Cover is undoubtedly going to be the better option. At 5.5mm, it's thicker than the Touch Cover but still impressively thin. We found that the keys themselves aren't too cramped and the travel feels natural and provides good tactility. We did notice the keyboard itself flexed slightly, especially when typing letters in the middle of the keyboard (like Y, G and B), but this wasn't a huge issue overall. We liked the felt backing of the Type Cover, too, which felt good to hold when the keyboard was closed onto the Surface RT. Microsoft has made plenty of noise about the strong magnets holding the Type and Touch Covers to the Surface. Like we've seen in some promotional videos of the device, including the company's new commercial, the reassuring click when you connect the Surface RT with the Type or Touch Cover is a nice touch. And yes, the magnets are strong enough to dangle the Surface on the hinge if you so desire, though the Microsoft employee demonstrating the device still felt the need to hold his hand below the tablet in case of an accident. The Microsoft Surface RT has a 10.6in display with a resolution of 1366x768, which is lower than both the third generation iPad and the latest fourth generation iPad. Microsoft officially says the use of ClearType rendering technology will smooth out any jagged edges thanks to the lower pixel count and also claims the screen is optically bonded and therefore less reflective than most other tablet panels. We used the Surface RT in a dimly lit environment, so weren't able to test its validity outdoors in a brighter environment. However, we can tell you that viewing angles appear to be exceptionally good and the Surface RT displays very rich blacks. However, we did notice that small text (particularly in the Internet Explorer browser) isn't as crisp or clear as the third-generation iPad we directly compared it to. The screen is certainly bright, however, and the colours of the Windows RT live tiles interface are vivid and do pop out. 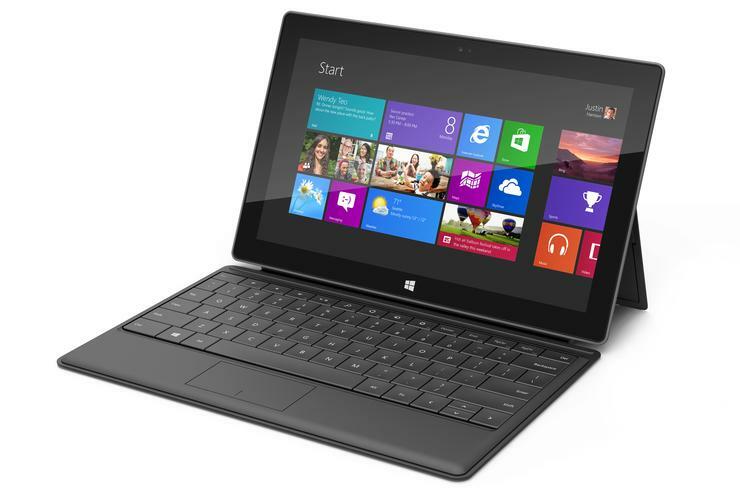 The Microsoft Surface with Windows RT tablet will be available in Australia in three models. The entry-level 32GB model is priced at $559, a 32GB version bundled with a black keyboard Touch Cover accessory is $679, and the 64GB model bundled with included Touch Cover is $789. All three models of the Surface RT can be pre-ordered now, though the Australian pre-order page currently shows a shipment time of "within 3 weeks". Australian consumers who pre-ordered the Surface RT last week were promised the tablet would be delivered by Tuesday 6 November.